In 1989 Rachel Amelia Presha found Toledo, Ohio. A town she said she became interested in because it was called “Holy Toledo” and Rachel considers her self a religious woman who follows the Bible. Described by those who knew her in Toledo and elsewhere as a kind and gentle woman, she is now 88 years old at last report. 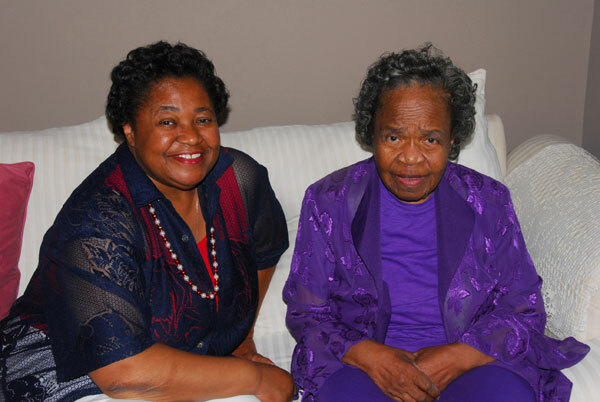 She lives with family back in Virginia who plan to open a Purple Lady Tea Room is her honor. I’ve come to the conclusion after watching so many of these conspicuous characters who populate our streets and the streets of many cities over the years, that their lot in life, may not be without some redeeming value for the rest of us. 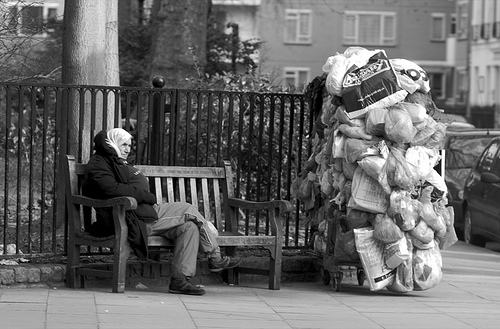 For the gift they give — is a raw form of street theatre. Little slices of drama and character studies that may be more powerful than what we could witness in a theater seat. It’s a chance to witness their unscripted, quirky, and eye-catching behavior that often provides the full arc of personality played out under the proscenium of life, be it humor or anger, sweetness or sorrow, or the foul and the fearful. And from these poignant performances, we are left to ponder, for long after. For even after they have exited the sidewalk’s main stage, we still remember them and their indelible roles.. And what more could you want as an actor, but to be ponderous and memorable? And many have certainly been memorable. The cast list is long and old in this makeshift urban burlesque that has playing nonstop for decades, if not centuries. How many reading this remember, Toledo’s most famous bag-lady, Elaine Higgins? She was so well-known for her many layers of ragged clothing and her foul odor and scolding tongue that even the Toledo Blade wrote a tribute editorial upon her passing in 1992. As the Blade noted, Mrs. Higgins became a symbol of homelessness and her role was to drive home the point with those who took notice of her, that such life on the streets is neither romantic or heroic. There were others, who also directed the spotlight of notoriety on themselves. There were of course the countless and ubiquitous street preachers who delivered their fiery sermons to the legions of shoppers and busy people who marched along Madison Avenue, trying not to make eye contact. 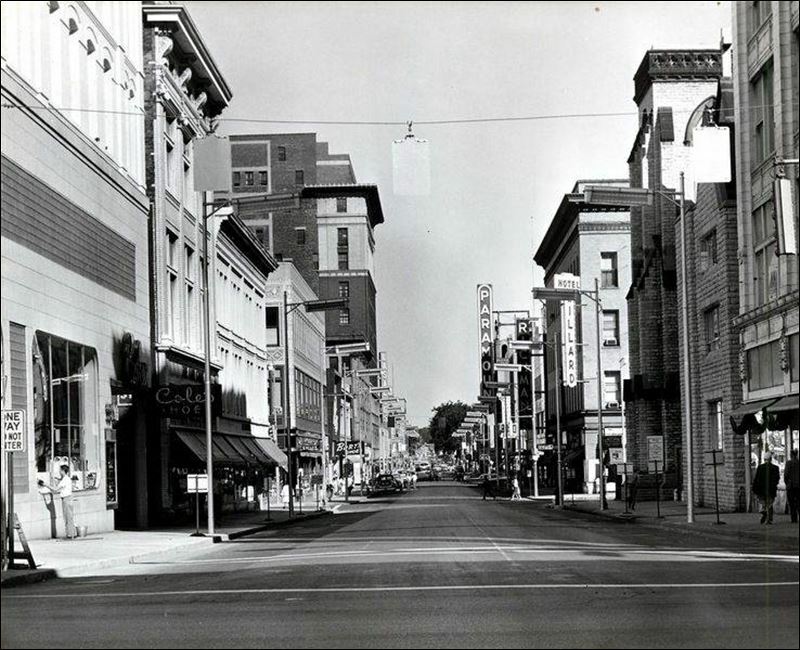 That was back in the day when there was a crowd on Toledo’s streets to preach to. Today, with so very few people out on the downtown streets at lunchtime, even the street preachers have given up and have gone elsewhere. One of them went to jail. Charles “Slim” Lake, who brought his self-styled ministry to the Toledo streets for many years, vacated his street pulpit when he was charged and sent to prison for food stamp fraud and money laundering. Long before Elaine Higgins, or the Purple Lady, there were other characters who had roles of remembrance on the streets of Toledo. In the once notorious skid row of ‘Suicide Flats” at Summit and Cherry Streets, was a man known simply as “Moses”. As Blade reporter Al Goldberg recalled in 1968, Moses was always clad in an ankle length overcoat and who took “tin-type” photos of the “willing passers-by” for a dime. And as Al wrote “he amassed of a small fortune of $40,000 which he willed to his landlady when he died in the 1930’s. She, as the story went, gambled it all away”. Goldberg also wrote of a another street preacher who was seen daily on St. Clair Street for 40 years and became a favorite sidewalk philosopher of the day. And “there was also a hat-passing harp player who carried his taller-than-he-was instrument over his left shoulder as he moved from store to store and bar to bar. Not all of the stories of Toledo’s strange characters are as harmless and innocent. In 1921, on June the 9th, the “Tinman”, a one time street preacher in downtown Toledo, who was as peculiar looking as he was in action, ended his battle with the demons inside him by taking the lives of two Toledo Policemen. 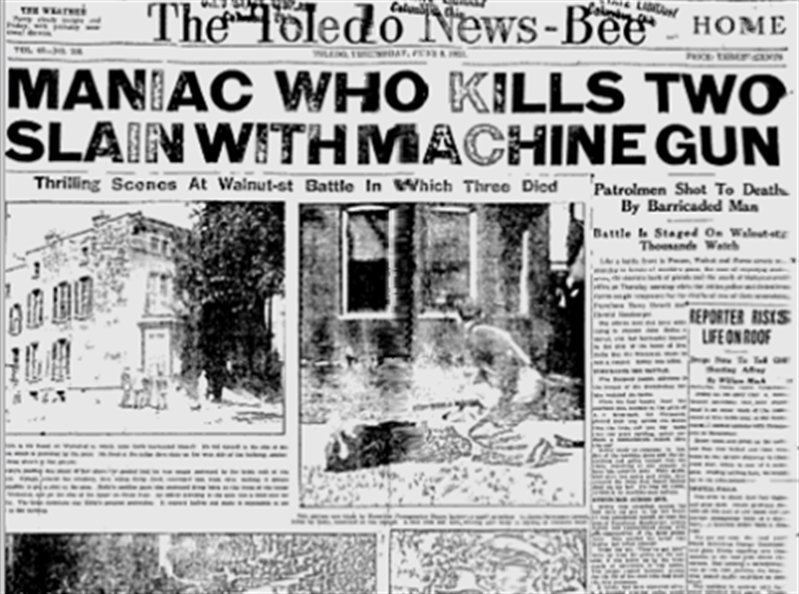 It was a fierce gun battle that played out at 611 Walnut street near Huron Street that day, one of the most spectacular eruptions of violence in Toledo crime history. John Kelley, the known eccentric who lived at the address was always a “strange” sort of man who walked with an unusual and stiff gait, earning himself the nickname of the “Tinman”, especially from the neighborhood kids who frequently followed and taunted him as he passed by. Kelley was also a self-styled street preacher is said to have been familiar to many in the downtown area and in Bowling Green where he lived before coming to Toledo. But on this particular day in 1921, when his landlady called police because Kelley refused to pay his rent, no one knew what lay in wait. Kelley, it seems, had been stockpiling guns and ammo for years, and barricaded himself inside his tiny apartment and opened fire on the police officers who responded. Patrolmen Harry Dowell and Harold Mossburger were shot to death by Kelley within minutes after arriving at the scene. The killings touched off a two and a half hour gun battle between Kelley and an army of Police who even brought out a mounted machine gun to the site and opened fire, as thousands(five thousand according to press reports) of neighbors watched the spectacle unfold. In the end, the two Toledo Police officers lay dead, and John Kelley was found dead in his bed from what police later said was a self-inflicted gunshot wound. Perhaps that’s what intrigues us about these mystery characters of the street, is that we really know little about them or their personal stories and what baggage or thoughts they carry with them. As with John Kelley, little did people know what monster raged within the heart of this bent and broken man. News Bee writer, Elmer Williams, a great observer of the city’s odd folk that lived on the streets of Toledo during the 1920’s, introduced readers to one of them in 1928 with his tribute upon the death of “The Socialist Kid”. His column on January 28th, told of how this young soap-box orator often appeared at Superior Street market to raise his voice against the capitalist “greed” of the merchants and money-changers and to extol the virtues of living in a socialist society where everyone was equal. he became a regular voice rising above the din of the Toledo marketplace, only to be hauled off to jail when some of the merchants felt his attacks had become too personal. It was from Williams’ column that we learn of other street characters of Toledo, like the man he dubbed “The Sleeper”, who he shared a cigarette with one day on the lawn of a park on Spielbusch Avenue and while listening to the raw faced old Mexican with the penetrating and contemptuous eyes and the large scar across his face, he learned that this man was raised in England for most of tis life and had been a horseman when his father moved the family back to Mexico. As he told, Williams, he joined the army of the Mexican renegade Pancho Villa and became a commander in is band of insurgents. He said he eventually gave up his involvement with that revolution and moved north. And so on that summer day..this man of mystery and Williams shared some time and watched the clouds race across the summer sky. The newspapers of yesteryear were good repositories of information to find some interesting nuggets regarding those peculiar personalities of the past who colored Toledo’s streets and piqued our curiosities. A 1925 Toledo NewsBee story..titled “Be Odd If You Wish”, offered the story of the man who was known to stand in the lobby of a downtown building and peer through the window of an adjacent restaurant watching the diners eat at lunchtime. If someone got up and left a newspaper behind, this stranger would run into the restaurant, grab the paper and run off with it and was often seen walking around with an armful of recovered newspapers. There was also a man who used to watch diners eat and when they left any food on their plate, he’d run into the restaurant, plop down at the table and finish the person’s meal. The writer of this story also tells of the woman, who in 1925, had been wearing the same Gibson girl hat and fur coast in Downtown Toledo since 1907. He reminds readers that she doesn’t care so why should you? Or the man in the Ohio building who drinks 5 quarts of milk a day, or the Toledo druggist who can smoke a cigar, eat chocolate and chew tobacco, all at the same time. There was hardly any era in Toledo when the streets were not filled with such eccentric souls who lived their lives the way they wanted, regardless of how it might be viewed by others. Before the 1920’s, when Toledo’s notorious “Tenderloin” district was running rampant with the vices of gambling, prostitution, drinking, drugs and dancing, the streets on what we now call the “Warehouse” district and 5/3rd field, must have been havens for the hordes of hard-bitten who patrolled those seedy streets, trying to get a meager meal, or just get some meager attention any way they might. In the 1940’s, a Toledo woman by the name of Grayce Milton got some attention – as the “Snake Lady”. Thrust into prominence and jail when she would show up at local downtown stores with a live snake wrapped around her neck like a scarf. In January of 1946, Grayce, a Cherokee Indian, sent shoppers into hasty retreat at one downtown store when she wanted to find a purse to match the skin of her favorite pet, Nokomis, a six-foot King snake whom she had brought with her as a fashion accessory that day. Grayce was subsequently arrested for creating a panic and disturbing the peace, which she gladly did once again when she brought her snake to court with her in a glass bowl. When the six-foot long snake tried to escape from the confines of the bowl, the courtroom emptied and Grayce and her snake were thrown out of court. Grayce would later leave Toledo and moved to Detroit with her 39 snakes and was arrested again in that city in 1947 when she took Nokomis on a shopping trip to downtown Detroit. Mrs. Milton said she used Nokomis to help her get seats on buses and she saw no harm in having a reptile as a traveling companion. The judge in Detroit agreed and ruled that Grayce was not violating any laws and could continue taking her snakes with her. Whether it’s the Snake Lady or the Purple Lady or the Bag Lady, Toledo has never been without its share of colorful and conspicuous characters of the street. Who are those that you remember? I’m sure I’ve only touched on a few and that over the decades, there have been many others who have commanded our curiosity. Whether motivated by mental, emotional or social challenges, or by harnessing their own free will to live as they choose, they are the players who create a spontaneous street carnival for all to see and absorb, often becoming memorable symbols of the Toledo experience. I want to hear about those that you remember.